The 46th champion in the history of the prestigious tricolored series will be crowned at the eighth and last round of the season; the Modenese driver Sergio Campana (BVM-Target) leads a group of six drivers with chances to win the title. 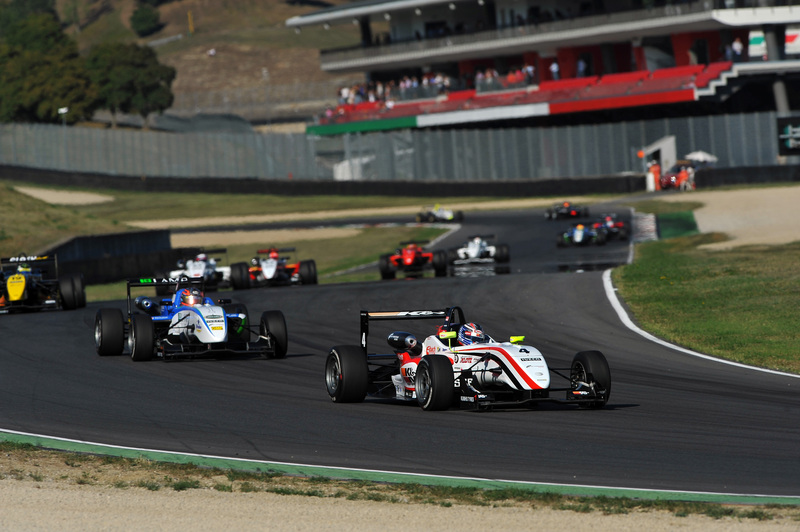 12/10/2011 - The eighth and most awaited round of the 46th edition of the Italian Formula 3 Championship is behind the corner. This weekend Monza's autodrome will house in fact the final act of the prestigious tricolored championship that will provide spectacle all the way to the last chequered flag. Six drivers will be competing for the title of the CSAI championship that is powered by Fiat Powertrain Racing since 2008. Sergio Campana (BVM-Target) has been on top of the standings since the fourth round of the season, held on the Belgian circuit of Spa-Francorchamps and he managed to increase his advantage to 19 points on his rivals at Mugello, a track where he actually seemed to be a bit off the pace. This gap is not large enough as 36 points are still to be assigned. The closest rival is the American Micheal Lewis (Prema Powerteam), the only one among the very strong rookies that managed to lead the absolute classification in this season (after the win in Spa's race one). The Californian centered his second win of the season recently in Mugello and showed all his intention in the collective test held last week in Monza when he set the fastest time relegating to half a second all the rivals in a season where the performance gaps have always been on the order of the hundreds. Equal on points at -26 from the top are the Italian Edoardo Liberati (Team Ghinzani), ruler of the series early in the season and back on the podium in Mugello, and the Swiss with Italian origins Raffaele Marciello (Prema Powerteam) who, after the second place in Vallelunga's round that gave him the temporary second place in the classification, has been pushed back by other rivals fighting for the podium of the absolute classification. The two Frenchmen driving for BVM-Target, Brandon Maisano, from Cannes and Maxime Jousse, from Les Issambres, follow in fifth and sixth place, respectively at -31 and -36 from the top. A pole position on Saturday, and the point that goes with it, could also keep a chance open for Jousse who is actually looking at the rookies classification. The first of the rookies will win, together with the 50.000 Euros money prize (120.000 will be given to the Italian Champion while 56.000 will be the race prizes), a special prize that only the Italian Formula 3 can offer since 2008. Thanks to Scuderia Ferrari, the winner of the Italian Championship and that of the Rookies Trophy will run an entire test day at the wheel of the Ferrari Formula One car in a test scheduled for 15 November at the Autodrome Piero Taruffi of Vallelunga. This is a prize that can be worth a career and the drivers that can aim at it are Lewis, leading with 142 points, the two pupils of the Ferrari Driver Academy, Marciello and Maisano, equal at -7, Jousse at -11 and Eddie Cheever (Lucidi Motors) at -30 with the latter still having a chance to to the 33 points assigned in Monza and to the discard of some results. The spectacle on track in Monza is certainly going to be that of special occasions as in the monument of the world motor racing all the other protagonists will also aim to end the season on the rampage. This is the case for the two Lucidi Motors color bearers, the Milanese Kevin Giovesi and the Brazilian Victor Guerin, authors of a strong final part of the season and for the Argentine Facu Regalia (Team Ghinzani) that saw race one vanishing in Mugello when it seemed to be already on his pocket after a stunning pole position and an uncatchable race pace up to the technical problem causing his retirement. After several incursions in the top ten, Simone Iaquinta (JD Motorsport), Andrea Roda (Prema Powerteam) and Federico Vecchi (LineRace - CO2 Motorsport) will also try and finish the season on a high. The weekend will begin this Friday with free practice at 10.20 and 15.20 (local time, GMT+2), while qualifying will be on Saturday (9.40) . Race 1 will follow in the afternoon (13.35). Race 2 is scheduled for Sunday at 10.00. The two races will be broadcast live on RaiSport 2.